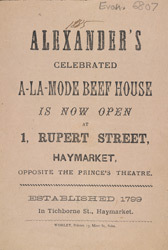 A La Mode Beef shops and eateries were popular in the 19th century. The beef was marinated in a wine or brandy mixture with carrots and onions and flavoured with herbs. It was a popular dish for city workers, food was nutritious and tasty, was served swiftly and was inexpensive.